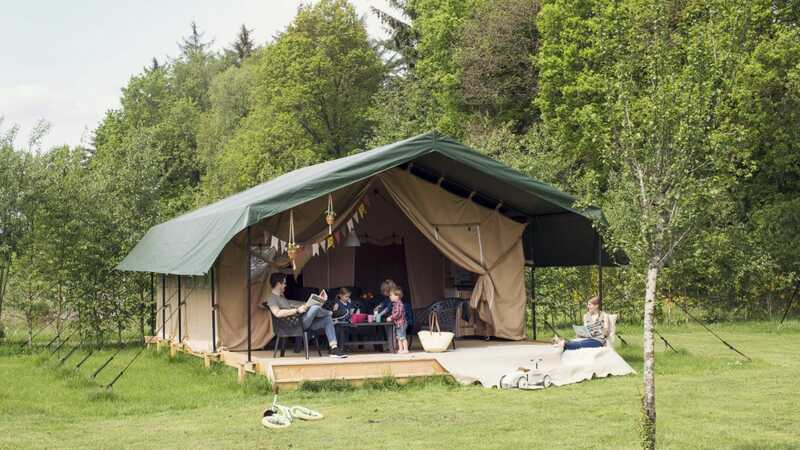 Our adventure safari tents are situated on the edge of our campsite and equipped for up to six people. You will not run out of space quickly with a floor space of approximately 40 square meters and a high ceiling, enabling you to stand throughout the entire area of the tent. The front of the tent can be opened completely, which is very pleasant during sunny days. In the back of our tents have two sleeping cabins, one is equipped with bunk beds and the other cabin contains a double bed (140x200cm). The only thing you are expected to bring is your personal belongings and toiletries – you can enjoy real camping pleasure in a unique accommodation! Our tents are ready for Check-in from 3.00 pm (15:00 uur) and Check-out before 10.00 am. Each of our tents is equipped with a kitchen unit on wheels enabling you to cook both inside and outside. The kitchen unit is equipped with four gas burners that are thermally protected and in the cupboards underneath it you will find all the crockery needed to prepare a delicious meal. An important feature of our safari tents is the canopy which enables you to relax outside even when the weather fails on you. Beneath the canopy is a lounge set and in the living quarters you will find a dining table with chairs. Our safari tents are not equipped with sanitary facilities, however our tents are equipped with electricity and lighting in both the sleeping and living quarters as well as beneath the canopy. The tents are also equipped with a refrigerator, coffee maker, kettle and a heater. Deposit/Cleaning* € 50 (payment in advance). Optional costs like a pet or a baby cot. *The deposit will be returned after the safari tent has been checked following your check-out.